Buy the Farm . . . Share: Coho Ho and a Bottle of . . . Radishes? Okay, quite possibly the worst post title yet. This is the part of summer that I love, the part where it forgets to be 100 degrees every day and settles down into the seventies and gives me a break, no need for air conditioning, and the ability to turn the oven on without wanting to die. 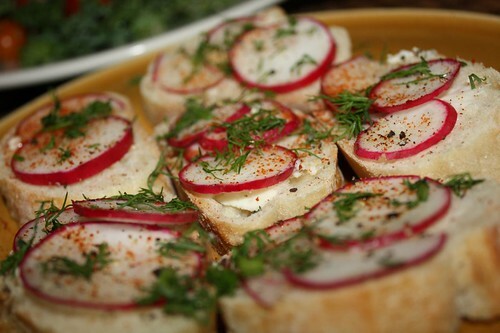 I started off by making these little baguette slices with butter, sliced radishes, and dill. I hear from most people that they hate radishes. I seem to remember really liking radishes as a kid when my parents planted them in the garden. This was probably the only thing from the garden that I would eat other than the corn and strawberries. This is one of my favorite things to make in the summer though I usually get around to making it a little earlier in the season. My fishmonger (the one who, it turns out, gives me facts about fish that are greatly misleading!) 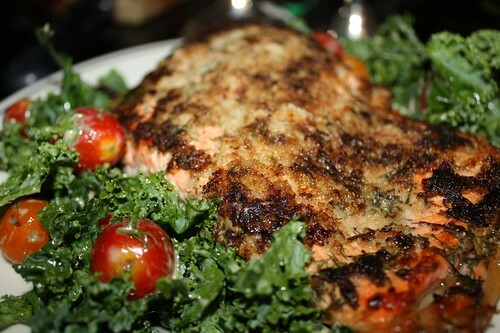 recommended this coho salmon. I smeared it with Dijon mustard, fresh dill, salt, pepper, and sprinkled some panko bread crumbs on it before searing it in a pan and finishing it in the oven. I made a kale salad with Hepworth Farm tomatoes, dill, and lemon as an accompaniment. It was a fantastic dinner which was only to be topped by ice cream at Longford's. Jen got the same flavor that her father thought was "disgusting." We really can't make heads or tails of that assessment as it is, quite empirically, delicious. It's ice cream! When's the last time you had "disgusting" ice cream? You must go to the Port Chester Longford's. The one in Rye was not very good at all. Which in turn creates some questions regarding the qualifications of the visting pastry chef from the CI mentioned on the Longford site. Ellerinize sağlık. Çok leziz ve güzel olmuş. The ice cream is fantastic. There can only be two possible explanations: 1.) there was something wrong that day that caused the ice cream to be bad or 2.) you do not actually like ice cream. I believe the Tiger Stripe ice cream at Kawartha Dairy would qualify as "disgusting". Orange ice cream and black liquorice should not be combined. The day Dad actually bought the tiger stripe ice cream and ate it was a great day. It was also a day that suggested Dad's taste in ice cream might be suspect. But it wasn't at Kawartha Dairy - it was the ice cream shop and go-kart track near Nana's cottage.